Vaseline traces its roots to the 19th century, when Brooklyn chemist Robert Augustus Cheeseborough first developed it as a natural remedy for skin abrasions in 1869. 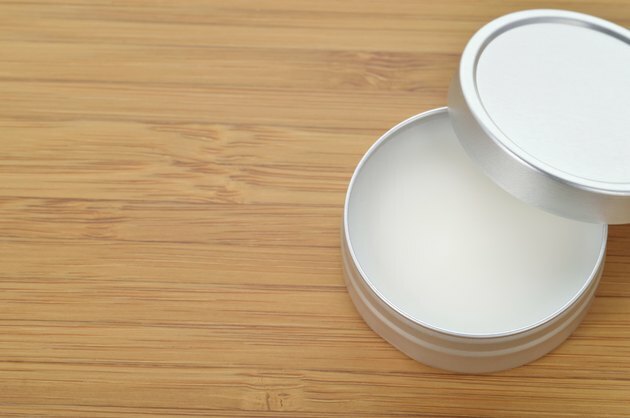 Petroleum jelly is a mixture of paraffin, microcrystalline wax and mineral oil. It prevents water from escaping the body through the skin and drying it out. Vaseline is an occlusive moisturizer. Occlusives form a sealant that locks water into the skin, preventing dryness, says AcneGuide.com. It can also resolve dryness by preventing further water loss from the skin, allowing the skin to repair itself from within. Vaseline contains paraffin wax. Paraffin wax softens and moisturizes the skin, reports the website Cosmetics and Skin. One of Vaseline's original uses was healing cuts and scrapes on the skin. The occlusive properties of Vaseline seal the skin breakage. This prevents bacteria or impurities from entering the wound, allowing the body's natural healing properties to work without interruption. Applying it to the lips works as a balm, soothing the surface and preventing moisture from escaping. Vaseline is also useful as a lubricant. Heidi Murkoff's website, WhatToExpect.com, recommends using petroleum jelly when taking a child's temperature rectally. After cleaning the thermometer, coat the tip with petroleum jelly before inserting the thermometer anally. Vaseline can also be used as a beauty aid. TheBeautyBrains.com, a website authored by cosmetic chemists, suggests using it to extend perfume and seal split ends. Rubbing a thin layer of Vaseline on the forearm holds a fragrance and makes it last longer. Vaseline can also seal split ends on strands of hair, delaying a trip to the salon.